Swinging the ball to the weakside and running ball screens are the two best ways to get high-quality looks in the secondary break. 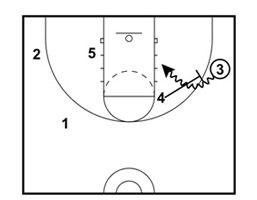 This quick hitter has misdirection along with rapid ball movement to confuse the opposing defense. It also provides the spacing needed to open up driving lanes for your perimeter players. The initial setup is a 4 out 1 in set. 1 makes a quick pass to 5. 5 swings it to 3. 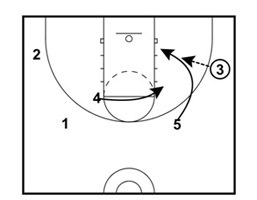 3 v-cuts to the free-throw line extended. 5 fakes a ball screen for 3 then cuts to the basket. 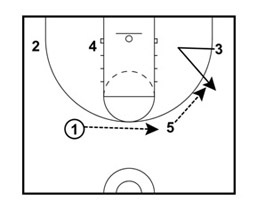 4 moves to the strongside elbow to set a ball screen. 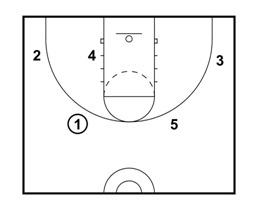 4 sets the ball screen on 3. 1, 2, and 5 are on the opposite side. I like this action except for one thing that could improve it: weak side movement to occupy the help defenders. As it is, 1 and 2 don't move which means their defenders can be in position ready to help and clog the lane on the pick and roll. Even something as simple as having 1 screen away for 2 or 1 cutting through and setting a screen on 4's defender and then filling out to set up for possible kick out from 3 on the drive.